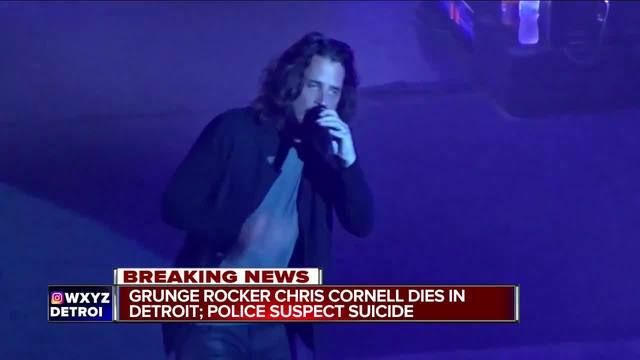 The Wayne County Medical Examiner released autopsy results in the death of rockstar Chris Cornell. His death has been ruled "hanging by suicide." According to the medical examiner's office, a full autopsy report has not been completed yet. Cornell gained fame as the lead singer of the bands Soundgarden and later Audioslave, died at age 52, according to his representative, Brian Bumbery. Cornell, who had been on tour, died Wednesday night in Detroit. Sources confirm to 7 Action News that Cornell died at MGM Grand Detroit following a show at the Fox Theatre. Detroit police say he died from an apparent suicide. Police say Cornell's wife called a family friend and asked him to check on his well-being. The friend forced open the hotel room door and found Cornell on the bathroom floor, according to police. We're told Cornell was pronounced dead on the scene. Formed in 1984 by Cornell, guitarist Kim Thayil and bassist Hiro Yamamoto, Soundgarden's third studio album, "Badmotorfinger," in 1991 spawned enormously popular singles "Jesus Christ Pose," ''Rusty Cage" and "Outshined" that received regular play on alternative rock radio stations.